Easy-on and easy-off track pads are perfect for temporary use on varied surfaces. Bolt-On and Clip-On Rubber Artliner-BLS Track Pads provide an easy transition from working in dirt with steel tracks to working on delicate surfaces where protection or traction is needed. They are made from durable, reinforced, cut-resistant rubber for temporary or short-term use on varied surfaces. Easily revert to steel track when protection is not required. These track pads work with triple grouser steel shoes. The rubber track pads come in two convenient mounting styles: bolt-on or clip-on. Both are easy to install and remove. These actions can be done quickly on-site, with no special knowledge. Artliner-BLS Track Pads are available for more than 1,000 machines and 40 manufacturers. BLS can also customize an Artliner-BLS Track Pad for your specific needs. Provides traction and protection against steel track damage on any surface your machine needs to work on. Eliminates the need for placing protective mats or boards under the steel track. No need to bring in a large truck to transport the machine just a few yards. Saves time and reduces labor costs. Quick and easy on-site installation and removal of pads. No specialized knowledge of drive chains is required. Increases machine versatility. Easily reverts to steel track for work in dirt or other areas in which protection is not required. Moves machines with increased stability and traction over unstable surfaces. Fast shipment for many popular machines. Unlike most competing products, Artliner-BLS Track Pads fit between the grousers bars of the steel shoe, preventing the pads from slipping. Pads are attached to the steel shoe, not to the machine. Available in two types of mounting configurations: Clip-On Track Pad or Bolt-On Track Pad. The Clip-On Track Pad attaches directly to the steel grouser shoe either by a bolt-on bracket at each end, or by a slip-over yoke at one end and a bolt-on bracket at the other. The Bolt-On Track Pad has threaded studs bolted through pre-drilled holes in the grouser plate. Available for many popular machines using 12-inch to 32-inch (300mm to 801mm) wide track shoes. Special non-marking white rubber compound is available upon request for any application. Durable track pads for excavators, asphalt milling machines, pavers and more! BLS Roadliner Pads have been proven in the field by satisfied contractors, dealers, and original equipment manufacturers. They last longer and are time-tested for use on heavy construction machines. BLS Roadliner Pads can handle extreme applications such as asphalt milling. 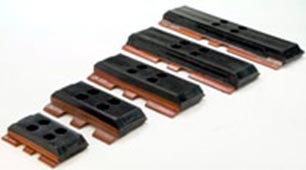 Save money by purchasing remanufactured bonded track pads for significantly less than the cost of new track pads. BLS refurbishes the metal components of the tracks (shoes and guides) then assembles them with new track pads and new track bands. BLS will pay the freight on your used cores. Turnaround time is approximately 3-4 weeks, plus shipping time. Questions? Click here to contact your BLS sales representative for answers.